Consider pipe sizing and motor power requirements before picking your pump. Plant engineers typically spend their time with the process to make sure machinery is working, water is flowing, power is produced, lights are up and no environmental problems are developing. They are not, as a rule, experts on any particular type of machinery. They are basically generalists, having learned to rely on qualified suppliers, who are experts within their particular niche (pumps, centrifuges, boilers, generators, etc.). When a pump fails, it is usually replaced with a new one, without much analysis or discussion. If it continues to fail frequently, a new supplier is approached for a better, more reliable pump. Occasionally, a relatively minor modification to the process, like an addition of a cooling (or heating) piping loop, for example, is needed. It may not be a particularly complex system, and hiring major design contractors may not be economical for such a small project. Yet, it might still be beyond the expertise of the plant engineers, maintenance and operating personnel. So, how is a pumping system, simple or complex, actually designed? 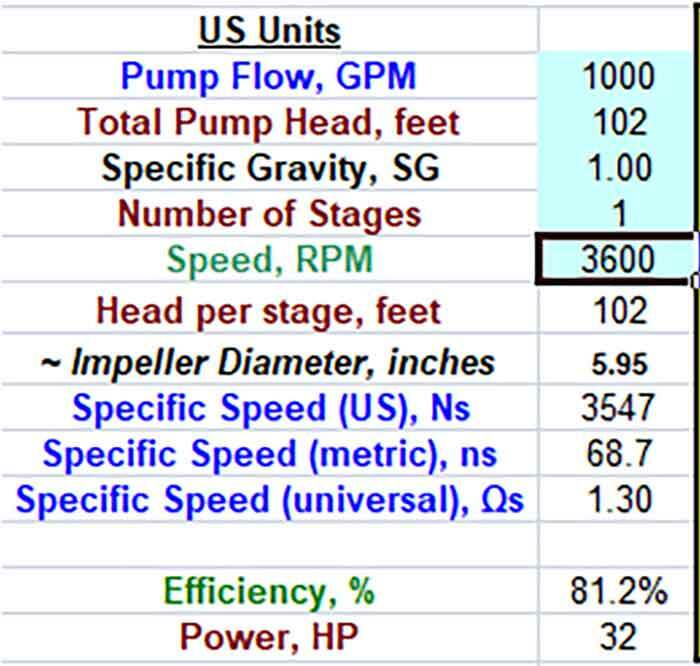 Details of pump performance curves, types, pressure, power or efficiency are usually not on the horizon at this initial stage. All the plant knows is their requirements. Maybe they want to pump 1,000 gallons per minute (gpm) from a cold water tank 2 miles away to a heat exchanger and return the water to the tank. Thus, the details of the pump will start to emerge. 1. Before talking about a pump, consider the pipe. 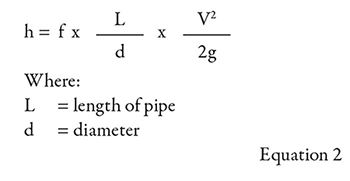 Velocity of liquid in pipes ranges between 3 to 10 feet per second (ft/sec). If the velocity is too slow, the dirt, sludge or other contaminants can settle. If flow is too fast, abrasive wear will reduce the life of the pipe. Plant designers are familiar with the specific concerns for each application. A sludge stream will have a larger pipe than a clean water application. But for a “nonexpert,” a good starting point could be, say, 5 ft/sec. Solving for pipe diameter (1,000 gpm, 5 ft/sec), we get d = 9.1 inches, so we round it to 10 inches to fit available pipe sizes. For now, we will not consider pipe schedule, wall thickness, etc. 2. Now that we have the pipe, pressure is the next step. Pressure comes from friction and elevation. We will assume no elevation changes along the pipe run. Friction losses are determined from a well-known Moody Diagram, from which a friction coefficient is found and then friction losses (h) are calculated (see Image 1). This is the friction loss a pump pressure would need to work against. 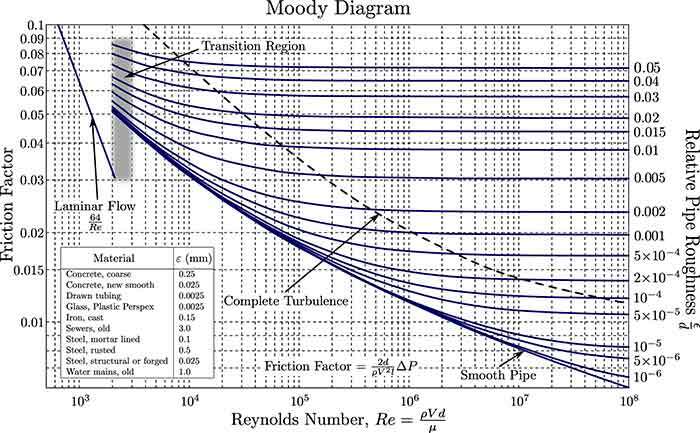 The Moody Diagram has lots of helpful information on it: Reynolds number (Re), pipe type/age, roughness, and thus friction coefficient, as seen on Image 1, may range from 0.01 to 0.1, potentially an error. Fortunately, some of this can be simplified. Re = 5 ft/sec x (10/12) (ft) / 10-6 = 4 x 106 - i.e. turbulent region and, from Image 1, we already cut down the friction factor to start from at least 0.2. 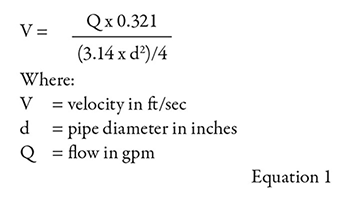 If we reduce this region from the rough pipe and super smooth pipes, we find that an average will be around f = 0.03 for an iron pipe of 10 inches diameter. 3. We now can estimate the power. See Equation 4. This will likely require a 40-horsepower motor. Note our “bold” assumption of the efficiency being 70 percent—a rough guess we need to refine now. 4. Go to the “Pump Efficiency Calculator” program. Plug the numbers into pump-magazine.com/pump_magazine/pump_magazine.htm (See Image 2). The actual efficiency predicted by the program is 81.2 percent, better than our estimated 70 percent, and the motor could be smaller. However, also consider that the pump might “run out” on the curve some times when the flow is greater. So a slightly higher value on the motor horsepower would be prudent. Now we need to refine our selection by the pump type, number of stages, speed of the motor (which may change overall size and efficiency) net positive suction head (NPSH) requirements, etc. But that is for the next time.